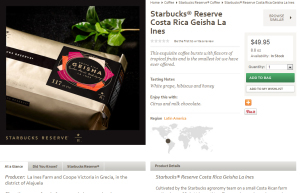 StarbucksStore.com will offer the most exclusive and small-batch Reserve Geisha coffee yet, beginning Monday, September 8, 2014. This is a really exciting coffee to talk about. 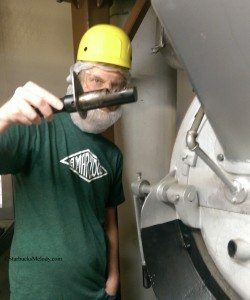 I went to its roasting, and literally watched Starbucks Master Roaster Brian Hayes roast the coffee that will be offered beginning on the 8th. What an incredible opportunity! 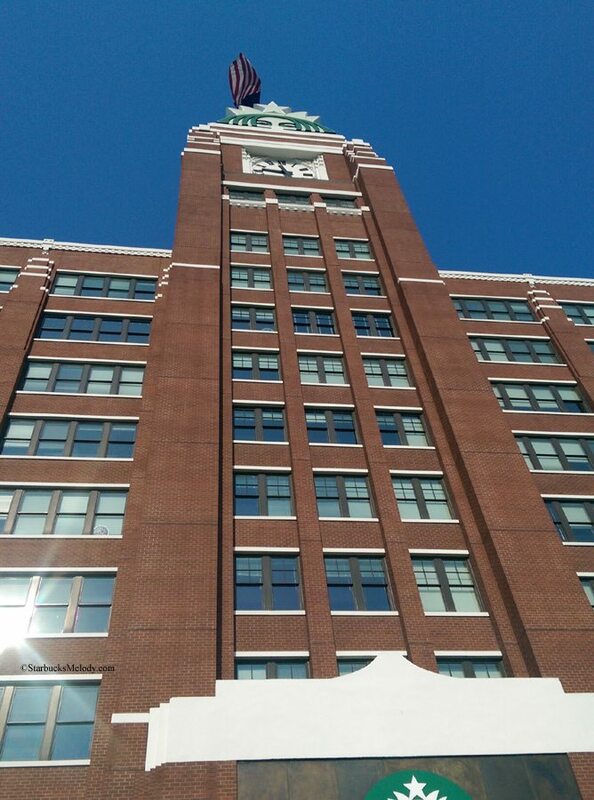 The Starbucks corporate partner whom I was with escorted me to the “Pilot Plant” inside the SSC. 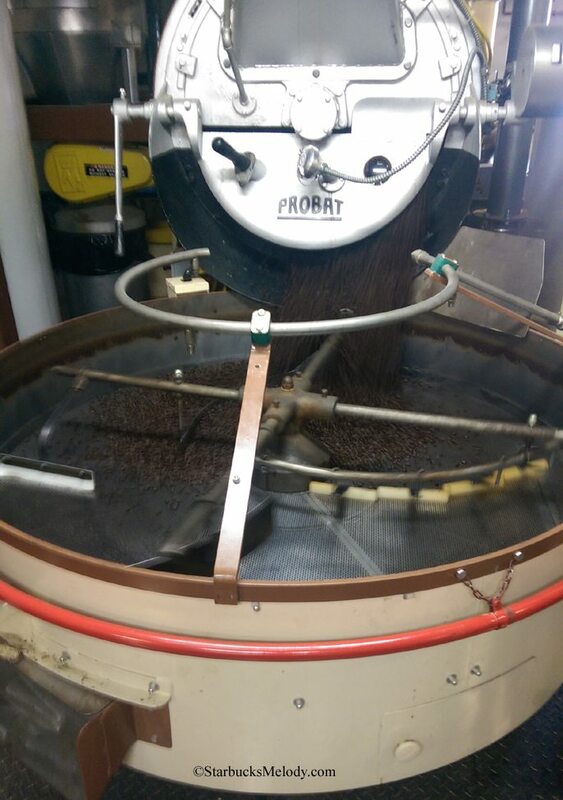 This is a small area of roasting operations inside the headquarters. 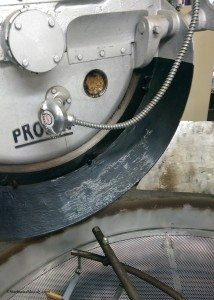 Coffee Roasting Master Brian Hayes explained that this Probat roaster can roast up to about 100 pounds of green coffee at one time, though that may only produce about 80 pounds of roasted coffee beans. The special Starbucks Reserve Coffee which I had the opportunity to see being roasted is the rare heirloom varietal “Geisha”. 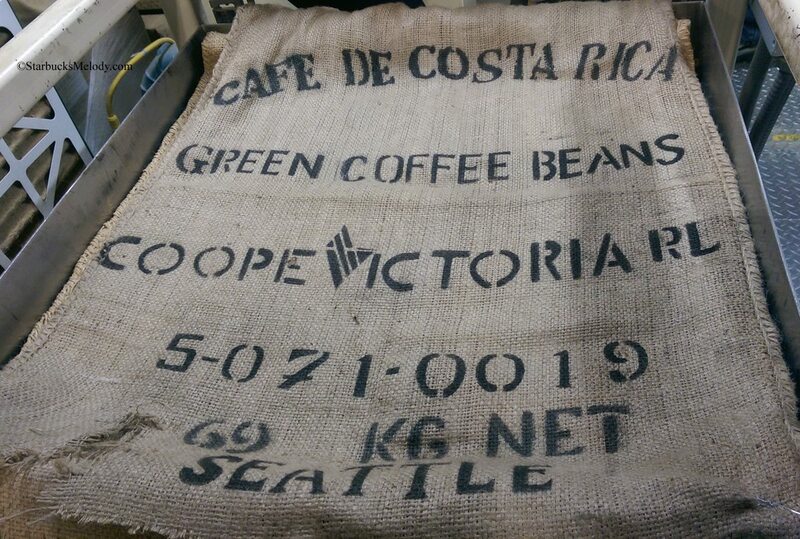 Starbucks was only able to secure about 150 pounds of this coffee from the La Ines farm in Costa Rica. Starbucks agronomist Carlos Mario Rodriguez worked with the farm to develop and secure this Geisha. It’s a washed-processed coffee, for those who are curious.Because there’s so little of this coffee, I imagine it will sell out fast on Monday! The first thing that Coffee Roaster Brian Hayes did was do a roasting of a test batch to ensure that everything was calibrated correctly. Then he roasted the coffee that you will be able to purchase on September 8th. The coffee sack from the test batch was very beautiful! 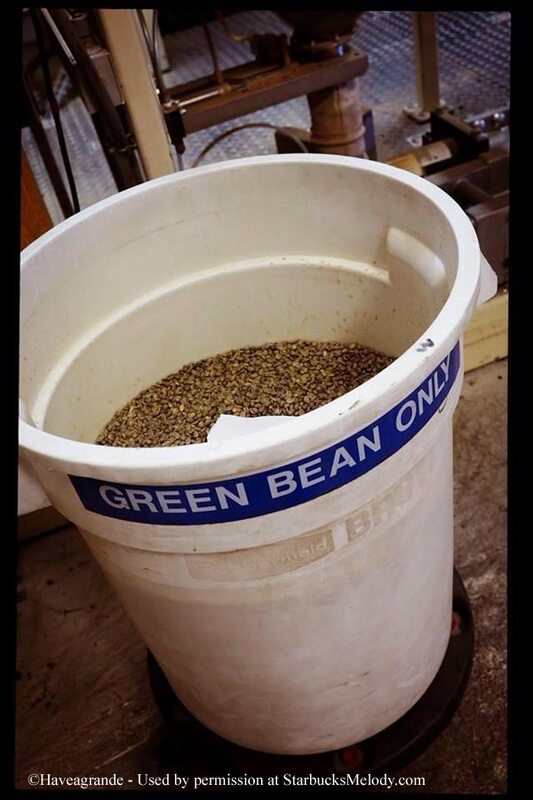 Here’s the coffee before it was roasted. This is all they had of the unroasted beans! 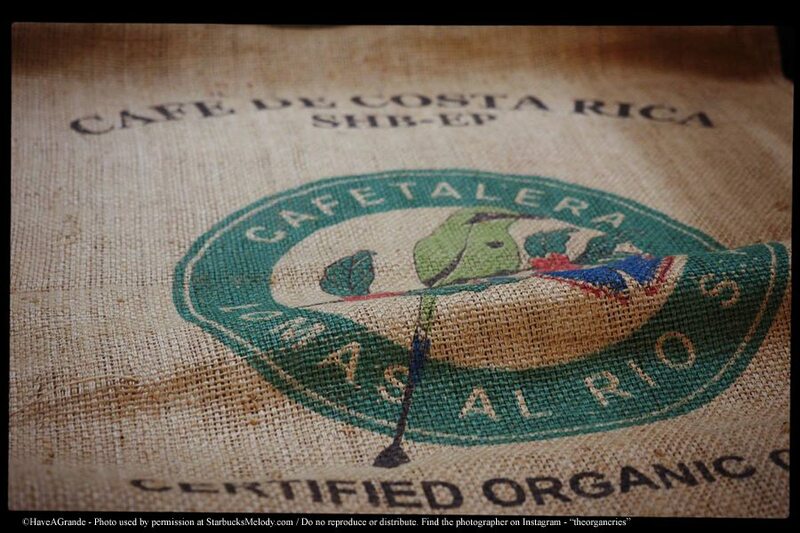 I know that I’ll go online on the 8th and order a bag of this Costa Rica Geisha. This coffee is so precious that no bags of it were passed out to those who were lucky enough to attend this roasting. There you have it. 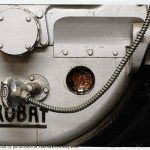 Hope you get a chance to enjoy this coffee and also enjoyed the inside view of one small aspect of Starbucks coffee roasting operations. This coffee is now available online (for a limited time, until supplies are gone). It’s being offered in numbered bags! Did they really roast a giesha to second crack? Did they happen to mention how they choose the roast level for their geishas? Did you get an hint at the price? The 300 and 450 pound batches they got before went for $50 a bag. @Kurt – I was there with two partners at the roasting. I’ll double check with them. I don’t even trust my own memory. 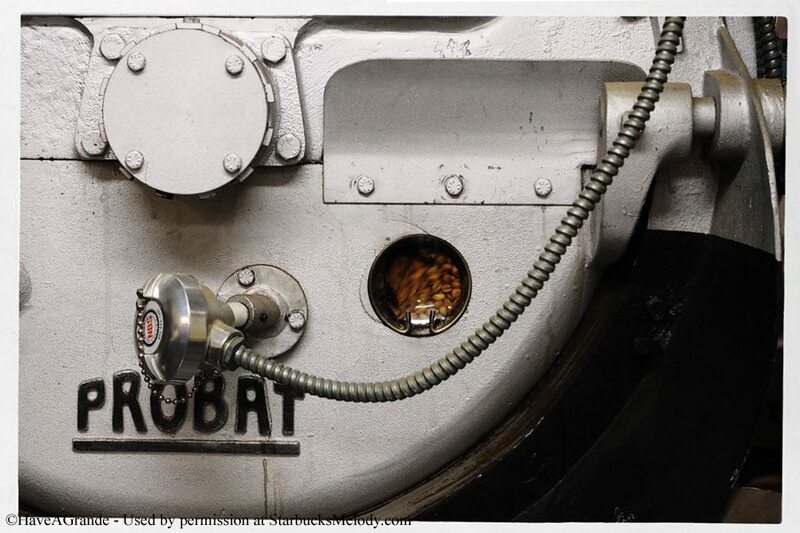 What I recall is that at the very start of second crack, the coffee got pulled out of the roaster. Don’t quote me on this. Sounds like you had a blast Melody! I continue to wonder why outside of Seattle the SB stores do not have this passion. I know you went to headquarters but there has to be some way for the passion in Seattle to transfer to other stores. Certainly, from your posts we see it elsewhere but more times than not I do not see it. I like when you get to report on your inside access at Starbucks. Very good PR for Starbucks and a vicarious thrill for your readers. @Purple1 – I kind of see what you’re saying. Though I don’t know how to fix it. I see part of the problem as that for many, many partners they go to work, and they don’t see anything that Starbucks is doing outside of their shift at work. I wrote a blog post once that was in response to a partner saying to me something like, “I get everything I need to know about Starbucks from my store.” I think it’s true you can get enough to meet the expectations of your shift, but when I see partners who are excited about Starbucks, those partners are also the ones who seem to be aware of what’s happening outside of their stores: They see the excitement in community service, opportunity at different stores, excitement in new store design, and all of the experimental and fun things that Starbucks does. I’ve met plenty of Seattle partners who are completely unaware that we’ll have a Starbucks café, roastery, and tasting room soon, right here on the corner of Pike and Minor. That IS exciting. But again, if you ONLY know about Starbucks from the perspective of an 8 hour shift on bar and/or on register, you’ll the fun things that are happening outside of your store. But I have no idea how to get partners to look beyond their four walls of their stores, And I’m not saying for a minute that this is all the problem, or that this is the whole solution either, I just know that the more excited partners seem to have a heightened awareness of things that Starbucks does outside of their specific store. @Melody and purple1 – when any employee does not have a “passion” for their job they are not going to be happy. They are also not going to advance and will eventually stagnate. These are the folks walking the protest lines thinking they are worth $15 an hour when the reality is they are not worth $1.25. 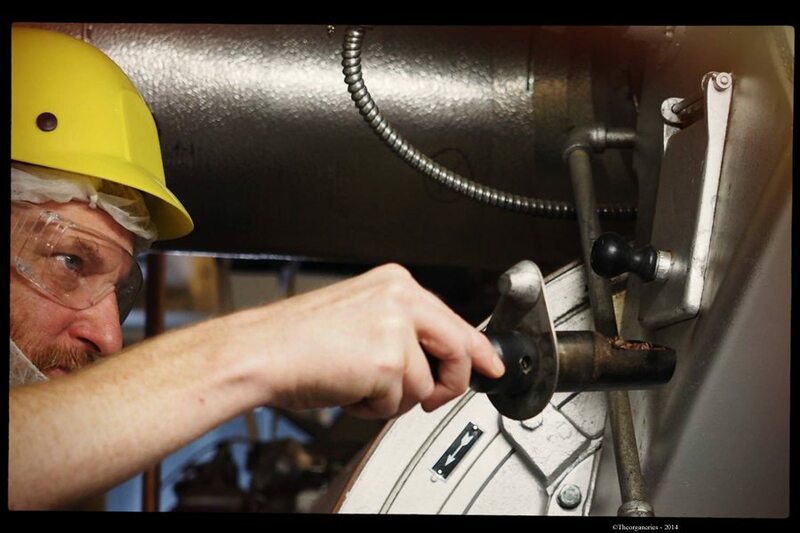 No job is just the time on your shift. Life is what you put into it. Not happy with what you are getting out of it? Well then you need to study, learn, experience, and work harder. Hahaha! 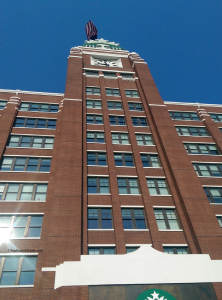 @Dean – That was an incredible day! I remember well it ending at East Olive Way. Pleasure to meet you in person. Great experience! And I agree with what Purple1 and DadCooks is saying. Lack of passion here but every once in awhile I come across a Starbucks employee that actually seems interested in their job beyond the paycheck. We had McD’s protestors arrested for standing in the street and blocking traffic . That doesn’t help their cause or make me think they should be paid $15 an hour. What an incredible opportunity! You must have been over the moon! 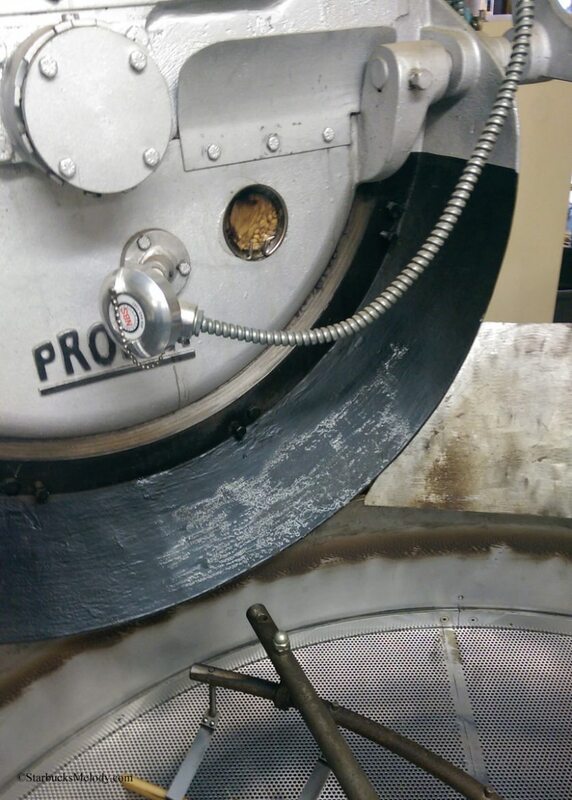 Roasting right to second crack sounds about right for a gesha cultivar. This is what is known as a Full City roast. Starbucks Blonde Roast (e.g., Veranda, Willow) is taken to this roast level. Anything past second crack is when the roast profile begins to overtake the origin profiles. It’s a little difficult to discern from the photos but I don’t believe I see any oil on the beans hitting the cooling tray. That’s a good sign the roast has not gone past Full City into Vienna or Full City+. 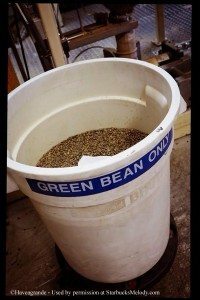 Last summer I learned coffee roasting from the roast master at Greenwell Farms in Kona, HI and I never got tired of the aroma of roasting coffee. I can only imagine the aroma that a high-quality gesha would produce. It must have been a magical experience. Random question: Do you by chance know what Starbucks does with the old burlap sacks? I have seen photos on your site of the sacks being used in store design but the sheer quantity of sacks that Starbucks goes through makes me wonder where the rest go. 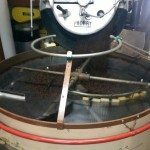 i was with melody on this day, and what we got to do after the geisha roasting was really amazing also.. we met with leslie wolford at coffee workshop 9, and had a coffee tasting with the panama los cantares. 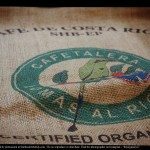 i am a partner and super passionate about coffee, and this was a dream come true for me. not only did i get to meet with one of my starbucks idols, but we got to have a coffee tasting and just share a moment. it was incredible. melody, are you going to do a blog article about that? i have pictures from workshop 9 also. @Kurt and @Organic Fair Trade Dave – Yes over the moon describes it well. And I’ve double checked as much as I can – I believe this is roasted right to second crack and no further. A bit off topic but somewhat related to my above comment. Saw the DM this morning at my local SB. First, I asked him about the broken tables in our store that finally were removed after being removed and returned removed and returned. When are they going to replace them? Well, he says there is not money in the budget to replace tables! Are you kidding? Second, I asked him about the difference between events, etc. in Seattle and where we are. Got a very businesslike answer really no answer. A bit annoying for sure. But, what I got from his response or lack thereof is that indeed there is a difference between what is offered in Seattle and what is offered elsewhere. @Purple1 – Not in the budget to replace broken tables? That’s a little crazy. They’ll have to fix them at some point – Starbucks doesn’t want broken chairs and tables in their stores! Melody the tables were so bad that they were forced to remove them from the floor and now there are two open spaces where the tables once were. The end result means fewer places for customers to sit! Plus it looks awful having the open spaces where you know you can fit tables. Trust me the DM was serious! 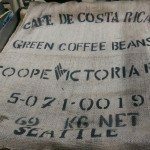 I’m amazed at how quickly this coffee sold out compared to the recent offering of the Panama Auromar gesha.